Finding a great location for your wedding can be tough. We did some leg work for you and listed some of our favorite locations for weddings. Plus, they are great spots to have BBQ catering as well. Close your eyes and imagine the surroundings of a perfect garden wedding. Wouldn’t you want the key elements to tantalize all of the senses and include masterfully planted gardens with fresh produce and exquisite flowers, extensive grass lawns, salient landscaping, babbling ponds, beautiful flower beds and colorful baskets, and white tents with twinkling lights all in a country setting? Then what better place than Stepping Stones Gardens because it offers this and so much more. We are a place so unique and enchanting that it makes the whole dream come true. There are several settings to choose from around the grounds for a beautiful and unique ceremony. They include the pavilion either under the expansive tent or the flowing organza, the rose garden, extensive lawns, intimate patios or even a variety of flora gardens. Stepping Stones Garden also has a rustic barn that can be as elegant as your creativity desires providing full protection from those unexpected showers. Both the barn and the pavilion seat up to 200. The barn has a caterers set up area with a stainless steel sink and countertops and a bar area with a granite countertop. The venue offers a beautiful bride’s room and fun groom’s den. We provide color accents around the grounds to enhance the wedding party and of course something from the garden is always provided. Call 800.451.8910. Write to weddings@rocheharbor.com. Visit http://www.rocheharbor.com/. An Eastside icon of elegance and sophistication, the impeccably designed and beautifully appointed Bellevue Club is well known for hosting fashionable Northwest weddings and events. Featuring dramatic entertainment spaces with modern decor, artistic finishes and lush landscaping, the Bellevue Club’s spacious Olympic Ballroom is gorgeous just like it is and can be easily customized to suit your unique wedding style. As part of a luxury boutique hotel with wedding night accommodations to die for, 200,000 square feet of athletic facilities, a full-service spa, and an array of gourmet dining options, this stunning property has everything you could need and more for a truly unforgettable celebration. Just 40 minutes from downtown Seattle, yet a world away, Salish Lodge & Spa combines stunning natural beauty, unparalleled luxury, and world renowned service and cuisine to offer couples and their guests an unforgettable experience. Perched atop breathtaking Snoqualmie Falls, Salish offers elegant reception site options for weddings large and small. Simply share your desires with their inspired on-site wedding coordinators, and let them handle all the details. All you’ll have to do is get married, enjoy your big day, and when the night is over check into one of the most comfortable and sensuous hotel rooms in the world. Now that’s the way to celebrate! Exquisitely appointed, and perfectly situated in the heart of Woodinville Wine Country, this world-renowned lodge with its elegant Northwest ambience, spectacular views of Mt Rainier, and five acres of gorgeously landscaped grounds is truly a “Celebration of the Senses”. The superior culinary team from the Barking Frog restaurant, and the exceptional event planners on staff are experts at ensuring that your wedding is divine in every detail. You can rest assured that you’ll be pampered from the moment you arrive, to your last farewell. Then, when your big day is over, you’ll be absolutely delighted to settle into one of the most romantic and luxurious wedding night rooms the world has to offer. The Woodmark Hotel lies on the shores of Lake Washington, with a stunning skyline vista of downtown Seattle and the Olympic Mountains. This elegantly appointed property is a distinguished world class hotel with all the charm of a private residence. The staff at the Woodmark is well known for their outstanding service, and the cuisine is simply exquisite. Be sure to ask about their spectacular wedding canopy complete with glowing chandeliers that provides the ideal coverage for sunset ceremonies. Rich with history, and elegantly renovated, the picture-perfect Manor House on Bainbridge island is perched high on a hillside overlooking the shimmering waters of Puget Sound. Preserving its original magnificence, while showing off modern amenities, this lovely oasis features warm and welcoming decor throughout that works as a seamless backdrop for your unique wedding style. Host your wedding at the Manor House Grand Hall and delight your guests with some of the best food and wine the West Coast has to offer, as they drink in a view that may only be described as magical. To discover how the Manor House can set the tone for your unforgettable Northwest wedding. Fresh flowers, fabulous food and memorable service await you at the Farm Kitchen venue, a scenic half-hour ferry & short drive from downtown Seattle. Treat your family and friends to the best of country entertaining any time of year at this 18-acre organic farm where you’ll find lush gardens and a renovated barn complete with a vintage dance floor. Ideal for “foodie” couples who love the natural beauty of the N.W., and truly appreciate the culinary creations the best chefs have to offer, Farm Kitchen is a charming, unique, and totally unforgettable place to host your once in a lifetime celebration. Discovering Bella Luna Farms just outside of Woodinville, Washington is like stepping into a secret garden sanctuary straight out of a French fairy tale. With impeccably maintained flower beds and vegetable gardens, a timbered barn and dining room with grape leaves hanging from the ceiling, and one of the most charming wedding night suites anywhere, this is a one-of-a-kind property that you simply must see to believe. Treat your senses to a beautiful experience, and make an appointment to tour Bella Luna Farms at your earliest convenience. This idyllic venue is becoming the talk of the town, and weekends are filling up quickly. 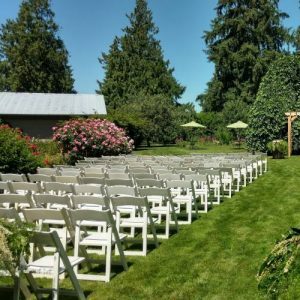 Celebrate your wedding day at Laurel Creek Manor, a sanctuary of English country elegance in Sumner, Washington. This five-acre estate is a perfect setting for both indoor and outdoor weddings. It features beautifully landscaped gardens, sparkling fountains, a charming wedding arbor, and a great room with a wood beam ceiling and French doors that open onto a lovely, spacious terrace. Laurel Creek Manor provides a handsome changing room for the groom and his men, as well as a spacious and beautifully lit bride’s changing room with a pink marble bathroom and private balcony. Both the manor and the grounds are picture perfect.